Monteverdi was a Swiss brand of luxury cars created in 1967 by Peter Monteverdi (1934–1998) and based in Binningen on the southern edge of Basel, Switzerland. 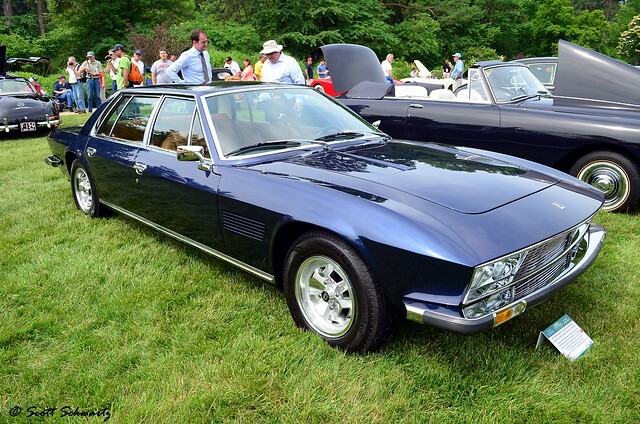 In 1969, Monteverdi chose the small Carrozzeria Fissore for further collaboration. Fissore re-designed the 375 Coupé and built the bodies that were then delivered to Monteverdi in Switzerland, where the cars were finally assembled. Now, the car has square lines but still elegant proportions. The 2+2 form became the standard model but subsequently other body styles were offered. First, there was a short-wheelbase 2-seat coupé called the 375/S and - on the same short wheelbase - a drophead dubbed the 375/C. Those cars are extremely rare nowadays. 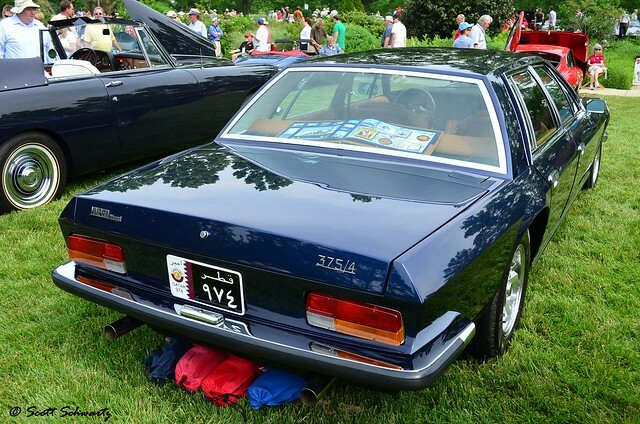 Soon, Monteverdi also offered a massive sedan called 375/4 and about 30 were built. 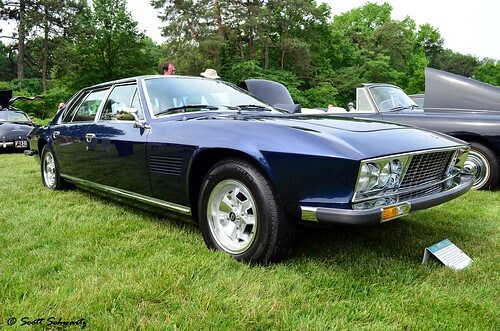 Other variations on the same theme were the 1974 Berlinetta with a different front styling and Triumph TR6 tail lights and another convertible, called Palm Beach, which remained a one off. The production of super luxury cars ended in 1976. By that time, Monteverdi had started the mass production of a new kind of car, well-equipped luxurious Off-road Station wagons. The first Model was the Monteverdi Sahara. In fact, it was not a Monteverdi development but a boutique car. Monteverdi used a technically unchanged International Harvester Scout, changed the grill and tuned up the interior. The second model was the Safari. In this case, Monteverdi also used a Scout but most of the bodywork was changed, once again designed by Fissore. In addition to standard Scout 5.7 Litre V8 there was an option to install the 440 c.i. V8 from Chrysler. The car had a proper, almost Italian look, and it sold well, in Europe as well as in the Middle East. Until the arrival of the Safari, Monteverdi's production had rarely strayed deep into the double digits (in 1971, before the oil crisis hit, about sixty cars were finished), but in 1979 production reached 350 (nearly all off-roaders). When the production of the Plymouth Volaré ended in 1980, Monteverdi chose another car to be converted. This time, it was the new Mercedes S-Class (W 126). The front got a massive chrome grille with four round headlamps looking like an Alfa Romeo Alfetta (third series), while the rear lamps were provided by Peugeot (505 sedan). It was announced in March 1982 for a price of 185.000 Swiss Francs, and badged as Monteverdi Tiara. It is not clear if there was serious production, particularly as the final design looked somewhat dated, being less aerodynamic looking, when compared to the Mercedes-Benz original. In 1978, work began on a four-door version of the Range Rover. This was executed with the active cooperation of Land Rover, who also allowed customers to order Monteverdi Range Rovers directly from Land Rover dealers. The Range Rover Monteverdi was introduced in March 1980, at the Geneva Motor Show. While the design work was carried out by Monteverdi, the actual work took place at Fissore's factory in Savigliano. White two-door cars were sent directly by Land Rover with an extra set of doors for conversion. Following the introduction of Range Rover's own four-door model in 1981, Monteverdi ended their conversions in early 1982. Around 167 cars were built, although a range of other numbers have also been suggested. Car production in Basel ended by 1984. The factory was converted into a museum, the Monteverdi Car Collection, which opened in 1985. In 1992, Monteverdi tried to re-enter the car scene with the Monteverdi Hai 650 F1 with no success. Two prototypes have been built, all residing in the Monteverdi Museum in Basel.